18 Landscape Architect and Specifier News n e w s On Saturday, May 19, staff members of Landscape Communications Inc. attended the 2018 Green Industry Induction Ceremony located at the historic Los Alamitos Race Course in Cypress, Calif. The night was filled with laughter and good food, as 7 juggernauts from different branches of the green industry were inaugurated into the Green Industry Hall of Fame. Esteemed guests, from all over the country, were in attendance at the prestigious banquet. To qualify for the Hall of Fame, the inductees had to have been in the industry for at least 20 years, be nominated by a fellow landscape professional, and exhibit qualities such as integrity, self-sacrifice, mentoring and educating and exhibited a passion for the profession that has resulted in positive changes within the industry. The Inductees: James Bethke – UCCE San Diego, University of California Agriculture & Natural Resources Cheryl Goar – Arizona Nursery Association Carl Kah – K-Rain Manufacturing Corporation Bill Cathcart, ASLA – Cathcart Associates, Inc. Roger Fiske – Fiske Landscaping Candy Fiske – Fiske Landscaping Judy Guido – Guido & Associates The inductees were each introduced by a landscape professional who could testify to their commitment to the industry and their contributions. Mark Pedicone (Green Industry Hall of Fame 2015) was the master of ceremonies for the evening. The Green Industry Hall of Fame was formed in 2005 by Richard Daigle and Charles Nunley with the mission, "To honor and preserve the contributions of those exceptional individuals who have served the green industry." This year marks the 13th annual ceremony and increased the number of inductees to 75. 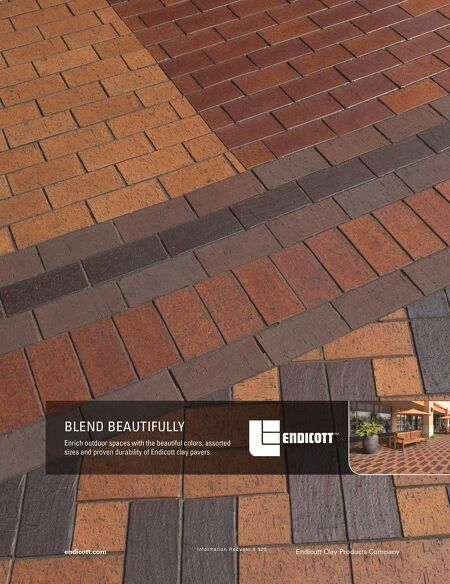 Note: Landscape Communications Inc. founder George Schmok (publisher of LASN and LC/DBM magazines) was inducted in 2014. 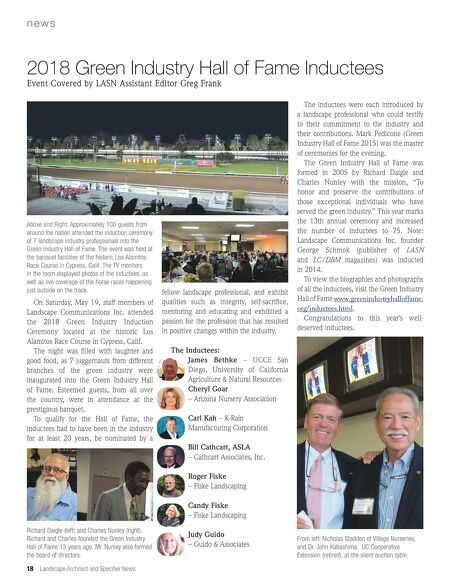 To view the biographies and photographs of all the inductees, visit the Green Industry Hall of Fame www.greenindustryhalloffame. org/inductees.html . Congratulations to this year's well- deserved inductees. 2018 Green Industry Hall of Fame Inductees Event Covered by LASN Assistant Editor Greg Frank Above and Right: Approximately 100 guests from around the nation attended the induction ceremony of 7 landscape industry professionals into the Green Industry Hall of Fame. The event was held at the banquet facilities of the historic Los Alamitos Race Course in Cypress, Calif. The TV monitors in the room displayed photos of the inductees, as well as live coverage of the horse races happening just outside on the track. From left: Nicholas Staddon of Village Nurseries, and Dr. John Kabashima, UC Cooperative Extension (retired), at the silent auction table. Richard Daigle (left) and Charles Nunley (right). Richard and Charles founded the Green Industry Hall of Fame 13 years ago. Mr. Nunley also formed the board of directors.